“Australia is a lucky country, run by second-rate people who share its luck.” History has seen people remember the first part of Donald Horne’s comment, yet disregard the latter, which he considered equally important. He was very direct in criticising 1960s Australia as living in the past and not reaffirming its uniqueness in a modern world. Horne wanted to challenge Australians to promote their own country and face their own responsibilities, instead of accepting the status quo and relying on the ‘she’ll be right’ psyche. Half a century since, the quote is still freely stated to explain the country’s good fortune. 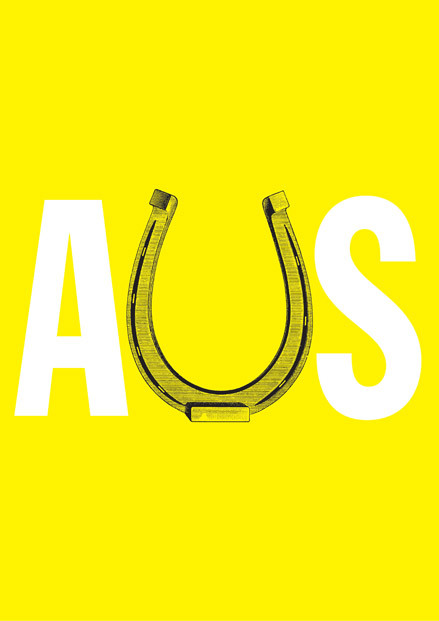 Whether it be our mineral wealth, sporting success, sunny weather, culture or avoiding the GFC, Australia is still regarded as the “lucky country”. Kellie lives in Adelaide and is Senior Designer at Parallax Design. In her final year of study she was awarded Best Graduate from the Australian Graphic Design Association and the Design Institute of Australia. Over the last seven years her work has been awarded and published internationally and nationally. In 2008 she received the Adelaide Advertising and Design Club Gold Chair. Kellie is currently Vice President of AGDA’s South Australian Chapter.